To add a little more nautical touch to the family room, I added a life preserver I picked up at the thrift store. It originally came with faded red ribbon and the wooden circle part was unfinished. A little paint and navy blue material left over from the pillows and it looked like new. I added wooden letters I picked up at the craft store to complete the look. To go to the beginning of the Family Room Makeover, click here. 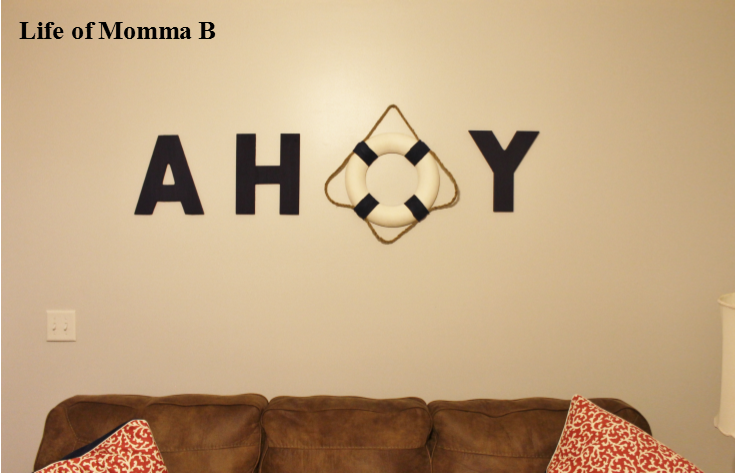 This entry was posted in Crafts, Home Makeover and tagged DIY, nautical, paint, rope. Bookmark the permalink.